Many insects deploy mimicry to fool their predators into thinking they are highly defensive, venomous, or simply not to be messed with. A great fraction of mimicry cases involve adopting the appearance of ants, wasps, and spiders for these exact reasons. One of the most interesting cases, however, is predator mimicry: insects that take the appearance of their potential predators in order to expose them. I have already written about one such case in crambid moths, but in this post I want to present one of the classic examples for this mimicry in metalmark moths of the genus Brenthia. At first glance, metalmark moths do not really resemble spiders. In my post about Petrophila moths I mentioned that observed spider mimicry might also be a case of pareidolia. In other words, we as humans seek familiar patterns surrounding us, so we recognize the image of a spider on the wings, but is it really mimicry? And indeed, after posting I was accused of having a strong imagination for thinking this is mimicry. There is a good point being made here – in the case of Petrophila there is a temporal barrier preventing the two from encountering each other under normal conditions. Petrophila moths are nocturnal while jumping spiders are diurnal. Nevertheless, the prevalence of such wing patterns in the insect world suggests that they have a role in the survival of those organisms. Metalmark moth (Brenthia hexaselena) displaying its typical body posture, with wings raised like a peacock’s tail. Brenthia moths are no different. It takes some imagination to strip them off their mothy characteristics to see the resemblance to jumping spiders. Members of family Choreutidae, the genus contains over 80 described species, all sharing the same appearance: a unique body posture, and wings patterns that are reminiscent of jumping spiders’ eyes. In fact their common name, metalmark moths, is due to the convincing “catchlight” area of the eyespots, often consisting of silvery scales. Brenthia species also move like jumping spiders, advancing by short bursts of movements while still retaining their wing display. Lastly, these moths are diurnal and can be seen active on top of leaves, just like salticid spiders. If you think it ends there for these moths in regards to anti-predator defenses, let me also add that their caterpillars deploy defense strategies as well. When alarmed, they launch themselves through holes chewed into the floor of their webbed feeding shelter, giving the term “teleporting through a wormhole” a new meaning. Metalmark moth (Brenthia hexaselena) in frontal view, displaying wing patterns that resemble a jumping spider’s face and legs. Brenthia moth (upper image) mimics jumping spiders (lower image) with wing markings, wing positioning, and posture. Figure from Rota and Wagner 2006 (drawing by Virginia Wagner). Portrait of a jumping spider (Phiale formosa). It is a little difficult to see the resemblance to the moth’s wing patterns, but the important thing is that it works to the moth’s benefit. When discussing animals mimicking their predator, it is important to remember that we humans are not the target audience. This means that the imitator may not look too convincing in its mimicry to us, but still manages to trigger a desired response from said predator. However, when in doubt, the best way to know for sure is to put the suggested mimicry to the test through a series of experiments. Brenthia moths have become one of the best examples of spider-mimicking moths, thanks to rigorous testing. In their classic paper, Rota and Wagner placed the moths with their potential predators, jumping spiders of the species Phiale formosa, in arenas and recorded the outcome. They also used non-mimicking moths of the same size as control for the experiments. The results showed that the jumping spiders respond to Brenthia by displaying territorial behavior and waving their forelegs. In other words, upon noticing the Brenthia moths the spider predators immediately expose themselves. It comes as no surprise that Brenthia moths had a high survival rate in the experiments, as they could take off once the danger was revealed, avoiding predation. The control moths did not trigger a territorial response from the spiders and were preyed upon extensively. Jumping spider (Phiale formosa) displaying territorial behavior in response to its own image. This is when the moth knows it is in danger. One thing to keep in mind though is that this mimicry works well only because salticids are special among spiders. They do not make a web to capture prey, but instead rely on their excellent vision to detect prey. They are active predators, and therefore display a wide array of behaviors to communicate with other salticids. Jumping spiders will avoid other jumping spiders due to the risk of cannibalism. Brenthia moths take advantage of this behavior to get the higher ground by delaying the spider’s attack in order to escape. This makes them one of nature’s greatest con artists, but when survival is on the line, anything is kosher. Diaethria – a festive caterpillar with antlers! In my last trip to the Amazon basin of Ecuador I had the fortune of meeting Paul Bertner, an acclaimed photographer and adventurer. I have been following his image posts and trip reports since I cannot remember when (and you should too! ), and was excited to spend some time in the field with him, in hopes of learning some new tricks. It was great fun to discover hidden gems in the rainforest together, while discussing arthropod biology, conservation and photography. During one of our night hikes we came across a tiny green caterpillar that was resting on a silky retreat on top of a leaf. At first glance it did not look very special, but then I noticed that its head featured two enormous antler-like horns. The horns were almost half the caterpillar’s body length! They were not simple straight horns, but rather complex structures that included many branches and hairs. I recognized the caterpillar as a member of tribe Biblidinae in the butterfly family Nymphalidae, but only later learned that it belongs to genus Diaethria. Despite their small size, Diaethria butterflies are quite well-known thanks to the characteristic pattern on the underside of their hindwings. Circular bands in black and white surrounding black dots, giving the impression of the letters BB, Bd or the the numbers 88, 89, 69 etc’. The common names “88 butterfly” and “89 butterfly” are typically used for species in this genus. They are often seen puddling – an interesting behavior in which butterflies take up minerals from mud, sweat and feces. Eighty-eight caterpillar (Diaethria sp.) is sometimes seen waving its horns while walking. Upon seeing the caterpillar I knew exactly how I want to photograph it. I wanted a frontal, head-on photo of the caterpillar’s head with the antlers stretched up in their full glory. What photo is more suitable for the holiday season than a festive caterpillar? Unfortunately, I did not have my high magnification MP-E lens with me (as mentioned, the caterpillar was tiny), so I gently collected it to photograph later. Let me tell you, photographing it was not an easy task. It seems that the caterpillar’s default behavior is to rest face down on the leaf, preventing any view of its antlers other than a dorsal one. It literally took hours to get it to change position, and I had to come up with a creative solution to get something remotely similar to the photo I had in mind. This deer-mimicking caterpillar wishes you happy holidays and a happy new year! One question that comes to mind is how do these caterpillars molt with such long head protrusions? Do the horns come out already stretched from the old head capsule or are they compressed as horn “buds” that inflate later? And what are those horns good for? They are most likely an adaptation against predators, but it is hard to say exactly how they are used. They can be used as defense to push away ants from attacking the caterpillar, or maybe the caterpillar drives away parasitoid wasps by waving the antlers from side to side. Hopefully someone will be able to document their function in the future and shed light on these remarkable structures. I sometimes like to drift away in my thoughts and reflect on my days before becoming a biologist. It is amazing to realize how much I have learned over the years. This is something I think many people take for granted nowadays. We are flooded with easily accessible information on a daily basis. Try to think how many new things you learned just in the last month. A little over a decade ago, I embarked on my first big overseas trip. Back then I knew close to nothing about Latin America. I had one goal in mind: to see poison dart frogs in the wild. Not too long into the trip I already felt victorious, after spotting some of these frogs in Bolivia and Ecuador. My quest took me to Costa Rica, where I found more of these stunning hopping jewels. Although I was mainly interested in amphibians, I was overwhelmed by the richness and diversity of arthropods. And more interestingly, despite my knowledge and exposure to various insect species, I realized how much I do not know and need to learn. One such moment occurred when I visited the pastoral town of Monteverde, more specifically the butterfly gardens there. The guided tour I took passed near a moth wall, which was basically a white painted wall with a powerful light source pointing at it during nighttime. This was the first time I have ever seen a light trap. It was packed with hundreds of moth species. I was fascinated. The other visitors – not so much. They were pressing me to leave these “boring brown bugs” so we can head over to the butterflies area. “Just a second” I replied, “there is one moth I have to photograph”. Leaf-mimicking moth, from Monteverde, Costa Rica. Amazing camouflage, down to the level of leaf (=wing) damage and asymmetry. Image scanned from an old film slide. “That’s not a moth” argued one of the visitors, “it’s just a fallen leaf that was blown onto the screen door”. The local tour guide smiled but kept his silence. Upon being touched, the “leaf” immediately came into life and took off in a slow flight, disappearing into the foliage. Many insects try to look like leaves. It is one of the most common types of crypsis. Only some of these insects, however, take it to the next level, mimicking not only the shape and color of leaves, but also their texture, tissue damage and even asymmetry. This moth had all of these. For years I have been waiting for an opportunity to photograph such a moth again, and finally, last year, I stumbled upon a similarly impressive species in the Amazon basin of Ecuador. Leaf-mimicking saturniid moth (Homoeopteryx sumacensis) from the Amazon Basin, Ecuador. It was resting on the bathroom floor – I do not think I would be able to see it if it was resting among fallen leaves. This species does look (and behave) very much like a leaf. Instead of laying flat like most moths, it holds its wings up in a way that creates a three-dimensional appearance. The forewing tips and margins are delicate; they are usually the first part to suffer tears and damage, contributing to the asymmetrical look of the false leaf. I knew immediately that I want to keep this photo for something special, and I decided to share it on the last day of National Moth Week. After posting it, the internet went wild. The photo was shared hundreds of times on social media, sparking discussions about evolution and moth diversity. It encouraged people to post their own photos of cryptic moths; others messaged me that the photo helped them to see the beauty and uniqueness of moths. I could not be happier. It is important to remember though, that this moth is just one small example from a vast world of moths. There are over 150,000 species of moths worldwide, many undescribed, and many more waiting to be discovered. Moths are everywhere. There is more to them than meets the eye. They take many forms, and can sometimes make you doubt yourself. Until that moment in Costa Rica I was not aware these leaf moths existed, and even today I am not certain of their exact species ID*. Even nowadays within the highway of free information, I still have a lot to learn. The positive feedback this photo received, as well as my orchid bees photo, made me realize also how much I am grateful for all the people who find my content interesting or inspiring. I never mention this, but it gives me a lot of energy. When things get rough, I remind myself that there is at least someone out there who thinks what I do is cool. I want to take this opportunity to thank all my followers, commenters and visitors. I got to know some fascinating people since I started posting. Thank you, everyone. *UPDATE: This moth has been identified by Vazrick Nazari from the Canadian National Collections as Homoeopteryx sumacensis, a saturniid moth. When all that people talk about right now is going outdoors with their smartphones and tablets to play the current-trendy Pokémon Go, an augmented reality game of hunting fictional creatures, it seems appropriate to remind everyone that a similar “game” was already in existence centuries ago and still goes on today. It is called being a naturalist, and the rules are pretty simple – you just go out to search for, observe, and document everything that nature has to offer. I guess making people spend more time outside is a good thing nowadays, I just wish they were looking more around them instead of having their faces glued to mobile screens. Nevertheless, many players reported that while playing the game they stumbled upon “real life Pokémon”, in other words wild animals such as snakes, birds and even mammals. Several biologists on twitter decided to take a nice turn on this game and came up with the hashtags #PokeBlitz and #PokemonIRL, tagging and spreading facts about various wild animals, plants and fungi. It is a cool initiative that I hope will spread like fire, but in any case I wanted to use this opportunity to mention another similar event happening this month – National Moth Week. National Moth Week is a citizen science project that sets out to increase public awareness and appreciation of moth biodiversity. It has been running continuously for 5 years, with the main event taking place on the full last week of July. During this week, moth enthusiasts set up light traps to attract moths and record the species found in their area. They are often joined by professional lepidopterists (scientists studying this insect order), who offer assistance in identifying moth species and wait for cool and unexpected discoveries. With the current accumulating evidence of dwindling insect populations, especially those of pollinators like Lepidoptera and Hymenoptera, this activity has huge importance. National Moth Week has become a global joint effort to record moth species, yet the project’s title remains “national” to emphasize the outreach activity on the local scale. Anyone can join and attract moths in the comfort of their own home, but many groups hold moth-watching events at public locations, attracting a large crowd of enthusiasts and curious people (you can attend an event close to you by searching in the event map). Many Crambid moth species, like this Desmia bajulalis from Ecuador, have iridescent scales on their wings. Setting up a light trap for moth watching is super easy. All you really need is a light source, and turning on the porch lights is probably the simplest way to attract moths. If you want to invest a little more, you can get a light bulb with some output in the UV range, as many moth species are attracted to this type of light. Many entomologists and insect enthusiasts use high-output mercury vapor bulbs because their spectral range seems to be more attractive for insects compared to other bulbs. Personally, I do not like these bulbs; they are very fragile, become extremely hot during operation and quite finicky to set up in remote locations. I use a compact version of a bulb that has a similar spectral distribution and get good results. My setup is built to be portable, so I now take my light trap almost anywhere I travel. Sometimes a light trap is not even needed for attracting moths. This gigantic white witch moth (Thysania agrippina) came to our bathroom lights in the Amazon rainforest, Ecuador. The light trap I used at Caves Branch, Belize, attracted a nice variety of interesting moths, including members of genus Petrophila (mentioned previously on this blog). When it gets crowded at the trap interesting behaviors can be observed, like this small moth feeding on a bigger moth’s hemolymph. Finally, if you want to be able to record the species coming to your trap, you will need a surface for them to rest on. The simplest way to do this is by stretching a white sheet behind the light source. The flying moths will come to the trap, bump into the sheet and cling onto it, allowing close observation and photography. Not only moths, but also other arthropods can end up coming to the light trap as well. And, if you are lucky, even amphibians and reptiles can show up to take advantage of the abundant food. The best thing about setting up light trap is that you never know what will show up. It is not uncommon to encounter a species that you do not know, or even better, find something that is very rare. Giant silk moth (Rhescyntis hippodamia), one of the heaviest and largest moth species found in the Amazon Basin of Ecuador. Geometer moth (Opisthoxia uncinata), from Limón Province, Costa Rica. This is probably one of the most common species in Latin America, it showed up in every light trap I have set up so far. Do not forget to check the surroundings of the light trap for even more species! This wasp-mimicking moth (<Gymnelia sp.) from Ecuador was found resting on the wall a few meters from the trap. Even a silhouette can be interesting! Crambid moth from Mindo, Ecuador. Sosxestra grata has become one of the most iconic Latin American owlet moth species, thanks to an excellent photograph taken by Thomas Shahan in BugShot Belize. Some of the nicest wing patterns are found on the smallest species, like this delicate Crambid moth from Mindo, Ecuador. So go out, and enjoy this fun activity. Moth-watching is the new birding. In fact, it might even be better than birding. It requires much less effort and preparations. 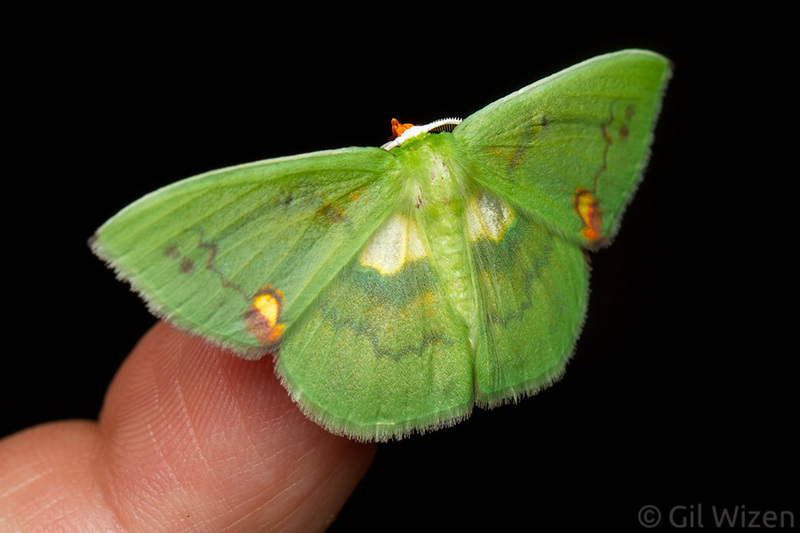 In addition, the diversity of moth species found in a limited area can be astounding compared to that of birds. There is so much out there to discover, you really just have to look. One of the things I intend to write about every once in a while is the use of insects in art or popular culture. I am still not sure if these will be independent posts or inserts within other posts. I thought I would start by talking about keeping insects as pets or insects drawn in Japanese manga and anime, but this week while walking atop one of the hills at Otago Peninsula, New Zealand, I was inspired to write about something more personal. When I was 10, I used to collect stamps. This hobby was largely encouraged by my grandfather, who was a serious stamp collector. I remember how just by looking in his albums at stamps from all over the world I sometimes imagined myself drifting away to a far away places. I could stare at them forever, and I also enjoyed the smell of old paper. Despite my grandfather attempts to infect me with his obsession, collecting any stamp from just about anywhere in the world was not very interesting for me. I decided to collect stamps of animals and plants only, but my favorite ones were insect-themed stamps, and I had many of them. Among the first stamps I got were two that I found especially peculiar. They depicted butterflies and came from New Zealand. I remember them very well – they were probably very common because I had dozens of them. But the reason I was intrigued by them is because something about the butterflies looked a bit off. I knew that one of them looked like Vanessa atalanta in a way (I was able to read English at the time, but I did not know what a red admiral is), the wing pattern seemed wrong though, especially for the hind wings. And the art looked, well, a bit like cubism. This week, over 20 years later, I got my answer. While I was starting to make my way down hill, I caught a glimpse of some bright red color from a nearby gorse bush. I went closer, and the butterfly took off. Still, it did look like a red admiral during flight, and knowing the territorial nature of this species, I decided to wait. And lo and behold, a few seconds later the butterfly returned to the exact same spot, only this time it landed on a rock. Now I could take a good look at it. Yes, definitely the same butterfly from the stamp, and the wing pattern fits perfectly. New Zealand red admiral, Vanessa gonerilla. Obviously this is a different species from V. atalanta that occurs in Europe and North America, but the similarity between the two species is striking, both in upper and lower sides of the wings. While the upper side has the same type of contrasty combination of aposematic coloration – black, white and red (probably to deter predators), the lower side is an explosion of colors (especially in V. gonerilla), and is used mainly for camouflage. Vanessa gonerilla, detail of lower side. Click for full size. The red admirals belong to the butterfly family Nymphalidae, and it is a good opportunity to mention that members of this family look like they have four legs only (instead of six legs like all other insects. See photos above). But a close inspection reveals that the adult butterflies do have six legs. The forelegs are shortened and hairy, and held close to the body. They are used for cleaning the butterfly’s antennae from pollen and sometimes even for tasting nectar. Portrait of Vanessa gonerilla, showing the specialized forelegs for cleaning antennae. They also have hairy eyes, how cute! By the way, similarly to the European and North American red admiral, the caterpillars of the New Zealand red admiral feed on nettle. The endemic nettle, Urtica ferox, also known as ongaonga, is a large stiff bush (can reach a few meters in height), covered with large stinging spines that remind me of the NYC skyline. I hear these plants are something you want to avoid at all cost, and they sound as bad as the nasty Urtica pilulifera I know from Israel. There was even one case of death caused by this plant (a similar event is reported here). Urtica ferox (ongaonga). Insert: I see a row of Chrysler Buildings, I don’t know about you. By the way, I also got to see the tussock butterfly depicted in the second stamp during my first visit to Otago Peninsula a month ago. They were very abundant, flying slowly between the grasses. Unfortunately, by the time I arrived to the site the second time, they were all gone. It was nice to revive a piece of my childhood while visiting a foreign country many years later. Sometimes you have to go halfway around the world to come full circle.